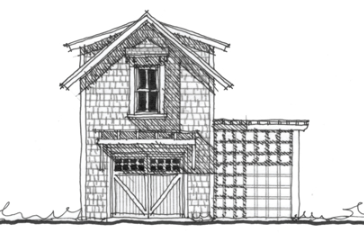 The 220 Magnolia Place Garage and Studio Plan by Our Town Plans! Outbuilding Plan: Meet the Studio Shed – a Design Star! Studio Shed. I have seen ads for these “sheds” popping up more and more and I’m telling you, THIS is where it’s at! Who doesn’t need a backyard structure to use for work, studio, guest space or a multitude of other uses? It doesn’t seem like there is a limit to the options that are available. I spent time today looking at the Signature Series. Wow. There is also the Summit Series, Studio Mini, Studio Sprout and Studio Wag series. All are great! You can design your own unit specific to all your needs and wants. Using the CONFIGURATOR you have options, size, siding choice, colors, configuration of doors/windows – and let me tell you, there are so many wonderful choices. I designed one and had a blast doing it. I really got into it thinking about how I would use it, what fun! I configured one, but then noticed I could scroll down for even more options – WHOA! Back I went… All you have to do is enter your name, email, and zip code so that they can give you pricing. This is the one that I saw a photo of and whoa! This would be my choice! What sharp design. Nothing cheap about this. Built to last! Studio Shed has a great short video (Located at the bottom of their Home page) that shows the interior of some and how people are using them. Brilliant. Sharp. This is a unit that will most definitely make you smile. At this point I would love to tear down our garage, and put one of these in its place! I was looking at the Signature Series – check out that link for more details. They build these in Colorado with the highest quality and green materials, pack them flat and ship them to you. You have the option for installation, DIY, Professional/Shell only or Professional/Including interior. Read more, you will be impressed! The Signature Series line has sizes from 6×8′ all the way up to 12×28′! You can see more images on Houzz for Studio Shed. I love seeing other people’s designs! Images are not for construction or reproduction, they are property of Studio Shed. Garage/Guest House Plan: G0063 by Allison Ramsey Architect! Garage and Guest Cottage G0063 by Allison Ramsey Architects. The garage is 357 square feet, and the guest cottage is 363 square feet with 1 bedroom and 1 bathroom. Perfect for guests, or if you live where you can also rent, this is a perfect small cottage apartment isn’t it? I love the lines of this Guest Cottage! 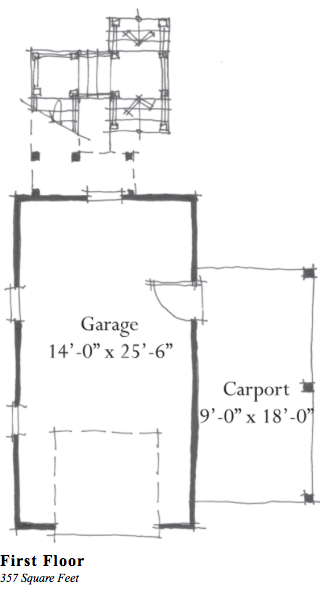 This garage plan also has a carport on the side, which comes in very handy, especially if you live where there are a lot of trees! Keeps your car much cleaner! The steps to the upstairs are located on the outside, back of the garage, not in view, which is nice! This little guest cottage plan has it all! 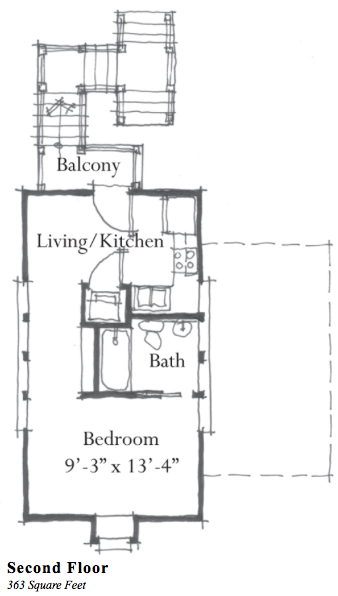 A nice size bedroom, a Living/Kitchen area, as well as a Bathroom and a… Tada… BALCONY! I love this plan! Catch you back here tomorrow!! Outbuilding: Guest Room G0057 by Allison Ramsey Architect! 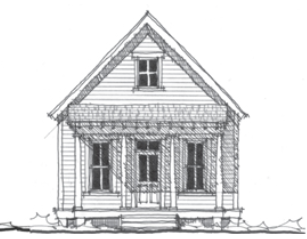 Goo57, one of the sweetest little guest cottage plans ever! I love outbuildings. Brilliant ones anyway… So i’m going to feature them on occasion. Many of them would make amazing studio’s, wouldn’t they? Whether you’re an artist, woodworker or any craft where you need space to have your tools (be it a hammer or a paintbrush) left out, so you can pick up where you left off! Sometimes I may feature a garage or a garage apartment, other times a guest room/art studio or even a garden shed. There are so many charming and efficient plans out there, and I gravitate towards them, so I thought I would share! This plan is G0057 by Allison Ramsey Architects. I think this would make a fabulous art studio/spare guest bedroom! At first I thought I would leave the Living area as is and use the Bedroom as a studio, but why? Now looking at it again, I think I would use the Bedroom as overflow when we had company in town. A bedroom, bathroom, and coffee pot for guests. We wouldn’t need a kitchen, a sink would be nice for cleaning up brushes, etc., as well as for making coffee or tea. 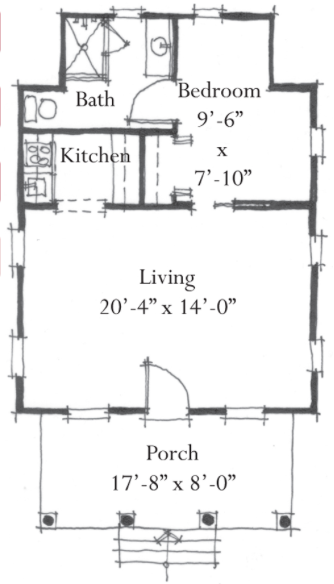 The living space could be used for painting, with maybe a few chairs at one end and a nice floor lamp, so you can contemplate what you’ve done… I think this is the sweetest plan! I would love to be able to offer guests their own private space! I love to dream about these plans! How would you use it?